AgroAtlas - Relatives - Lathyrus sphaericus Retz. - Spring Vetchling. Lathyrus sphaericus Retz. - Spring Vetchling. Family Fabaceae Lindl. 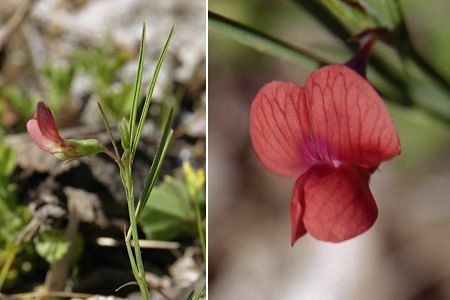 genus Lathyrus L.
General distribution: Caucasus, Central and Atlantic Europe, Mediterranean, Asia Minor, Iran, Himalayas region. Former USSR: Crimea - foothills, South Coast; Caucasus - all regions except for Talysh; Central Asia - mountain Turkmenistan, Pamir-Alai. On exposed stony slopes, in juniper woodlands, weed in fields, at roadsides. Galushko AI. 1980. Flora of the North Caucasus: Handbook. V.2. P.165. (In Russian). Grossheim AA. 1952. Flora of Caucasus. 2nd ed. V.5. P.403. (In Russian). Wulf EV., Maleyeva OF. 1969. The world resources of useful plants (food, forage, technical, medicine, etc.). Reference book. Leningrad: Nauka. P.232. (In Russian). Fedorov AA., Tzvelev NN., eds. 1987. Flora of the European part of the USSR. V.6. Leningrad: Nauka. P.497-498. (In Russian). Shishkin BK., Bobrov EG., ed. 1948. Flora URSS. V.13. P.492-493. (In Russian). Cherepanov SK. 1995. Vascular plants of Russia and adjacent states (the former USSR). St.Petersburg. 990 p. (In Russian). © Photo by Jean Michaux ( http://crdp.ac-besancon.fr/flore/flore.htm ).